Pat chicken dry with paper towels and season with salt and pepper. Pour ½ of the olive oil into a Dutch oven and place the oven onto heat. Add half of the chicken and cook until golden brown on both sides. Remove chicken to a plate and repeat with the balance of the chicken. Remove skin from the chicken. Dice the onion and cut the carrots and celery into ¼” pieces. Melt the butter in the Dutch oven heated to 325 degrees. Add in the carrots, celery and onion seasoned with ½ tsp of salt and cook about 10 minutes until onions are translucent. Peal the potatoes and cut into 1” pieces. Whisk broth, cream and potatoes into the Dutch oven and add in the bay leaves. Cover the oven and cook until chicken is fully cooked. Note: Breasts take about 20 minutes while thighs and drumsticks take about 60 minutes. Add in breasts after other pieces have cooked for 40 minutes. 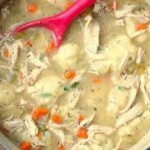 Remove chicken pieces from the Dutch oven and allow chicken to cool. While the chicken is cooling, prepare the dumpling mixture by whisking together the flour, baking powder, baking soda and salt in a bowl. Stir in the milk and buttermilk until the liquid has been incorporated and the mixture is smooth. Remove the bones from the chicken, shred the meat and return it to the oven. Mix in the peas and parsley. 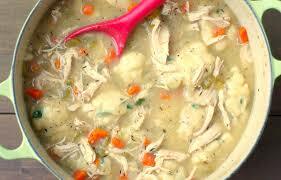 Use a large spoon and drop eight ½ cup portions of the dumpling mixture onto the top of the filling. Brush the dumplings with melted butter. Cover the Dutch oven and bake at 325 degrees for 20 to 30 minutes. Allow the bake to set and cool for 10 minutes before serving. Use 24 charcoal briquettes for the outdoor cooking of this recipe with charcoal as your fuel. Place 15 lit briquettes on top and 9 underneath your Dutch oven. Replace your coals about every 30-40 minutes. You may need more coals in windy or cold weather.